Convenient grocery products that replicate warm, homemade snack foods are alluring. Although many are certainly not out of a tight budget’s range, you might be surprised at how much money you could save by simply making these products yourself. Some people may assume that making them at home is time consuming and complicated. In fact, many are quite simple to create. Here are two great snack ideas that can save you up to 90 percent of what you would pay for similar convenience items. Those wonderful, aromatic fresh-popped popcorn bags can be made at home for a fraction of the price. If you consider how inexpensive popcorn itself actually is, you have to stop and wonder why you would pay so much for it just because it was in a cute, printed bag. You can purchase a bag of un-popped kernels for less than two dollars in many stores. 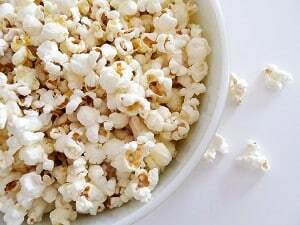 Depending on the size of the bag, you can make as much as twenty times the amount of popcorn for the price of the others. There is nothing mystical about the bags the branded products use; a brown paper lunch bag will work just as well. It is the microwave that pops the corn, not the bag. You can measure out about a quarter cup of kernels, add a drizzle of oil and place them in the lunch bag. Double-fold the top of the bag and place it inside the microwave with the folds down to keep the bag closed. Microwave the bag on high for about three to four minutes. After it’s popped, you can add flavored salt, butter or whatever seasonings you like. Just about everyone loves cookies, and we all know that homemade ones are the best. You have two standard options for home baking when it comes to cookies. You can buy all of the ingredients and make them from scratch, which is time consuming and involves lots of measuring, or you can purchase pre-made cookie dough. Neither option is particularly expensive, but here is a third idea. If you have eggs and oil at home already, you can make freshly baked cookies by purchasing one other simple and very inexpensive ingredient—cake mix. Cake mix cookies can be made from virtually any flavor of cake mix ever created. You simply mix the entire box of dry cake mix with two eggs and one-third cup of oil. Form the mixture into small balls and bake on a cookie sheet at 350 degrees for about seven minutes. Assuming you already had two eggs and a little oil on hand, the entire batch of cookies probably only cost you a little over a dollar.